The research aims to investigate the nature of the materials used in the decoration of the cover of a sunk-panel Commissione Dogale, a Venetian manuscript of 1582. The analysed volume Ms. It. VII, 1869 (= 8134) belongs to the collections of the Biblioteca Nazionale Marciana, Venice. The Commissioni were intended as official documents written on parchment and issued by the Doge of Venice. Their bindings were very rich in decoration, especially those produced in the late 16th century. This manuscript is a sumptuous example of the Venetian Renaissance artisanship influenced by Middle Eastern style: its cover was made of gilded leather, painted with arabesque branches and buds and lastly lacquered. The scientific examination of the lavishly illuminated cover was performed before the book-binding conservation treatment, as the characterisation of the decoration materials allowed to plan an appropriate conservation project. The research first step has been the non-invasive observation of the cover surface by digital microscope through UV–VIS radiations. Then, the study of the composition of these materials has been carried out with ATR-FTIR spectroscopy, Raman spectroscopy, XRF spectroscopy and spot-test analyses on samples. 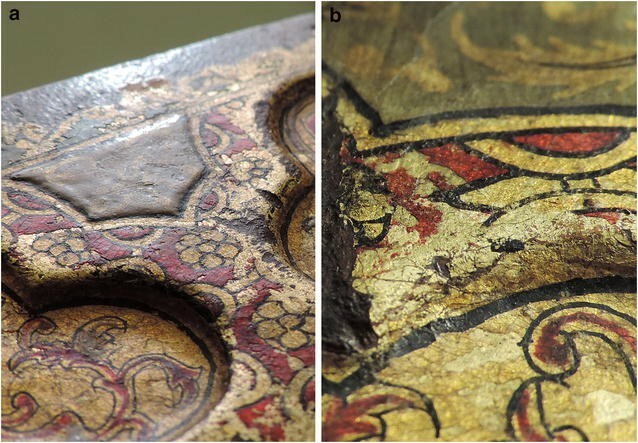 Pigments like minium, green earth, a lead-based yellow and smalt have been detected in the painted layer, while a precise identification of the resins and varnishes layered on top of the decoration was not possible because of the heterogeneity of samples. Furthermore, the materials used for this cover can be usefully compared with those detected by other recent analyses carried out on a variety of 16th century Venetian book illuminations. The so called sunk-panel style could be considered as the most lavish typology of book-binding developed in Venice during the Renaissance. Its flourishing is mainly related to the 16th century production of Commissioni Dogali: these were official documents issued by the Venetian Republic Chancellery and by the Doge of Venice from the 13th until the 18th century. They were written on parchment and contained transcripts of laws and guidelines that had to be followed by the representatives of power in Venice’s overseas and mainland domains [1, 2]. Venetian artisans used a wide variety of fine materials and embellishments in order to transform the Commission volume in the symbol of its recipient’s social status: the cover materials and decoration techniques could vary from simple parchment and gold tooled leather to silk velvet, brocade and, lastly, silver plates during the 18th century. These typologies of bindings were presented in 1999 and in 2000 by two articles describing some Venetian libraries collections and the British Library (London) ones, respectively [3, 4]. Commissions with the precious sunk-panel binding began to appear in Venice in the middle of the 16th century and their production was concentrated in its last third, with some examples at the beginning of the 17th century too [5, 6]. These volumes were different from contemporary leather bindings in cover structure and decoration because they were strictly relying on Islamic artisanship. Due to their mixed Western structure and Oriental decoration, the Venetian sunk-panel bindings have been fruitfully compared with other luxurious coeval artworks by history of art scholars, especially in several 1990s and 2000s publications [7–11]. An interesting example of Venetian sunk-panel binding is the Commissione of the Doge Nicolò Da Ponte to Marc’Antonio Contarini as Podestà of Vicenza (Fig. 1): it is a Commission dated 1582 and held by the Biblioteca Nazionale Marciana, Venice (BNM) . This volume structure greatly represents the sunk-panel style. Boards are composed by two pasted layers of paste-laminate materials: the external one was carved following decorative Islamic patterns and then it was pasted over the lower one obtaining a surface with a varying depth. A fine skin, which was usually a maroquin goat, was moulded and pasted over all the boards and on the spine, to define these elaborate motifs. The cover presents an overall gilding: gold leaf was applied over the entire leather becoming the background for the detailed pictorial decoration. Persian and Ottoman elements like arabesque branches and thin buds are brightly painted with black ink onto this gilded ground and filled with red and green colours. The composition is symmetrically embellished by a thick coloured layer applied over the gold leaf with the creation of a relief effect in some areas: this additional paste surface is also fully adorned by sinuous flowers painted with golden and black inks. A layer of varnish applied by brush covers the entire surface: this is the reason why this type of binding is called “lacquered” like its Islamic models (Fig. 2). The BNM Commission required accurate analyses to allow a conscientious conservation treatment due to its poor state of conservation . The inner structure of the sunk-panel cover was visible due to woodworm attack and surface abrasion and this permitted to study it for the first time. The cover decoration materials such as pigments, ink and painted layers were scientifically examined to discover their composition. Moreover, the analyses results also allowed the formulation of new hypothesis and attributions related to the manufacture of these artworks. Non-destructive analytical techniques were preferably applied in this study due to conservation constraints on handling and sampling of the volume; however, analyses with different invasiveness levels were performed, due to the necessity of gain more insight into the analytical results. Firstly, the Commission cover surface was observed by using a digital microscope. This allowed to distinguish strata and their configuration and to identify the damaged and listed areas where samples could be taken because the decoration was partially lost. It was not possible to separate the varnish from the coloured layers; neither were they from the gold leaf. Consequently, samples showed a high degree of heterogeneity. Secondly, the Infrared spectroscopy (ATR-FTIR) was applied on samples to reach a first pattern of the materials involved in the Commissione cover decoration. The ATR-FTIR analysis provides certain structural clues to the overall molecular structure of the unknown sample substances. Unfortunately, when a sample is composed of several strata the technique reveals peaks of all these materials and information are reported in the same spectrum concurrently, with a lack of reliability. Raman spectroscopy was carried out to provide a structural fingerprint by which molecules can be identified, thus clues detected by the ATR-FTIR could be confirmed. Spot tests were performed only on two samples in order to further investigate the nature of the pigments. Then, the XRF analysis were limited to one specific sample, the 5_1869_BNM: this analytical technique allowed the characterisation of the particular greenish paste sample. Millimetric samples were collected with a scalpel to remove them gently from the cover surface. Eight samples were selected and named with progressive numbers, the volume reference and the acronym of the library (for instance 1_1869_BNM). Six of them gave interesting results to analyses. The observations were performed by using the Dino-Lite AM4113T-FVW digital microscope at two different magnifications (50×, 200×) and under two types of LED lights switchable between white and ultraviolet (UV) light (390–400 nm). The sensor has a maximum resolution of 1.3 megapixel. Samples for stratigraphic studies were embedded in AKEMI® Marble Filler 1000 Transparent Waterclear resin mixed with the AKEMI® Hardener B curing agent; it is a two-component product based on UV-stabilized, unsaturated polyester resin dissolved in styrene. Resin blocks were cut by a hacksaw and, consequently, manually polished on abrasive foils with decreasing grain size. The final diamond polishing suspension was not used in order to avoid chemical transformation on the samples. Analyses were performed using a Bruker’s ALPHA Platinum ATR spectrometer provided with a single reflection diamond in Attenuated Total Reflectance (ATR) module; the spectra were collected in the 4000–500 cm−1 range with a resolution of 4 cm−1; each spectrum was the average of 64 measures. Spectra interpretation was performed on the basis on the general [14, 15] and specific literature on conservation-related materials [16–19]. Micro-Raman spectra were recorded using a Jasco NRS-2000C instrument with a 100× objective, in back-scattering conditions with 4 cm−1 spectral resolution. Samples were excited by using the 532 nm laser line provided by a frequency-doubled Nd: YAG laser (Raman Laser Modules, RGBLase) and a power of 10 mW at the sample. The detector was a 160 K cooled charge-coupled device (CCD) from Princeton Instruments Inc. The power of the laser was reduced or increased in order to avoid sample overheating and fluorescence background. Spectra were collected with a Bruker’s ARTAX 200 micro X-ray spectrometer with a Mo anode without any He flush to avoid the tiny sample movement. The X-ray tube was set in two modalities: at 50 kV and 700 µA, with a collimator of 1 mm in diameter, and acquisition time of 60 s; at 12 kV and 1100 µA, with a collimator of 0.2 mm in diameter and acquisition time of 180 s.
In order to validate the results obtained with the spectroscopic analysis, samples were investigated with micro chemical test as described in Stuart  by using a portable chemical lab, the MiniLabor Plus E-12 by Bresciani Srl, Italy. Elements or compounds were identified observing the characteristic colour changing or precipitation. The Normalizzazione Materiali Lapidei (NorMal) method of identification issued by Istituto Superiore per la Conservazione ed il Restauro (ISCR, Rome) was adopted . 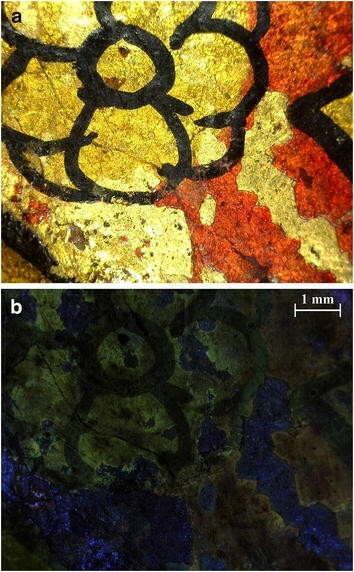 The observations of the cover surface and the cross sections with the digital microscopy under white and UV lights highlighted the decoration strata succession. Leather was applied on the pasteboard with a thick adhesive and then gilded with gold leaf. 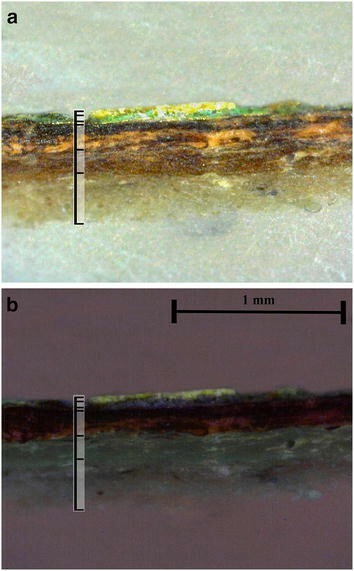 It is possible to detect the gold leaf thin regular stratum in all the cross sections and no other layers are visible between the leather and the leaf (Fig. 3). The above decoration presents floral patterns: firstly, a black ink sign marked out the shapes of the Islamic elements and flowers; secondly, red and green colours filled the grounds and tendrils. Lastly, a thick greenish paste was applied to point out the decoration with reliefs: flower petals, tendrils and the extended central areas of the composition were enhanced with this stratum that, finally, was make precious with golden flowers and black lines (Figs. 4, 5). The observation of the verso of the sample 5_1869_BNM was useful to understand the greenish paste morphology: it seems to be a combination of fillers—for instance gypsum—and yellow and blue pigments, surely mixed with a binder. Pigments particles are clearly visible through digital microscopy (Fig. 6). The protecting varnish coat is characterised by a strong, yellow colour and its yellowish fluorescence is visible through UV light suggesting the presence of natural resins such as dammar, mastic, sandarac or colophony . This layer covers the volume external surface as last stratum: it was applied overall the decoration using a brush. Due to the non-selectivity of IR spectroscopy, the ATR-FTIR signals might arise from molecular groups located everywhere in the sample, even at 2–3 microns below the surface, due to the depth penetration associated to the ATR sampling mode with diamond crystal . Furthermore, peaks of different substances located in the same spectrum area might be overlapped and hidden. As a result, the totality of samples presented similar peaks due to the common presence of the leather ground and of the varnish coating. Traces of oils and/or resins were found in each sample, due either to the varnish presence, to the colours binders or to the gilding adhesive; therefore, the spectra present sharp broad peaks in the region between 3300 and 2800 cm−1 (C-H stretching vibrations) and in the 1700 cm−1 (C=O stretching vibrations) areas [16–18]. These peaks were compatible with those of linseed oil, sandarac, colophony and shellac resin, but the identification must not be considered as definitive for the previously mentioned possible overlapping of the peaks. Two protein peaks are constantly present around 1642 and 1540 cm−1 (amide I and amide II vibrations, respectively): they mainly refer to the leather . The sample 3_1869_BNM (from the gilded leather; binding, left board) could be considered as an example of the leather and varnish peaks (Fig. 7a). The sample 5_1869_BNM was the most interesting because of the composition of the thick greenish paste. The recto (Fig. 7b) and the verso (Fig. 7c) showed similar peaks except for the presence of oils and resins in the recto, resulting especially at 2918 and 2851 cm−1. The verso peaks are strikingly delineated. Protein peaks are at 1636 and 1542 cm−1. Other peaks could be observed in the spectrum at 1022 and 779 cm−1: they likely refer to the blue pigment as made of smalt. Finally, the sample’s peaks at 1395 and 679 cm−1 probably refers to a lead-derived pigment, perhaps the lead oxide massicot yellow (PbO) which main peaks are at 1390 and 681 cm−1. The 1395 cm−1 peak could also refer to the calcium carbonate (chalk) presence: despite the absence of the typical calcium carbonate peak (875 cm−1) on the verso, this value seems to be clearly distinguishable on the recto at 879 cm−1 [16–18]. The samples 4_1869_BNM (from the red coloured background; binding, left board) and 6_1869_BNM (from the green external frame of the painted decoration; binding, left board) were studied for the red and the green colours compositions, but the weak results suggested to carry out different analysis, as the spot tests. The high fluorescence of organic materials when dealing with Raman analysis made the sample spectra useless. In spite of this, the sample 5_1869_BNM gave the only Raman spectrum of the entire research. The verso of the greenish paste produced the Raman spectrum (Fig. 8) of a lead-based yellow pigment, named massicot yellow, which the band at 147, 289 and 385 cm−1 can be attributed to. The small band at 340 cm−1 could be probably assigned to litharge which has the same composition as massicot (PbO), but a different lattice structure: massicot is orthorhombic, while litharge is tetragonal. The two pigments are often found together since they interconvert into each other due to the laser induced heating . A less probable attribution of this last peak could be to pararealgar, a light induced polymorph of realgar, which was a widely used pigment by Venetian Renaissance artists . Aiming to determine the heterogeneous composition of the greenish paste, the sample 5_1869_BNM was analysed by XRF spectroscopy both in the recto and in the verso, with different settings of the X-ray tube. The spectra showed a large quantity of chemical elements, which intensity values in some cases change in the recto and the verso (Fig. 9). Firstly, the using of blue smalt is clearly depicted by the presence of potassium, cobalt, nickel, arsenic, bismuth and silicon (and possibly iron) . Secondly, regarding the characterisation of the yellow pigment, the large variety of lead–tin–antimony yellows used in the artworks during the 16th century makes the identification difficult . Nevertheless, the high content of lead seems to confirm the use of a lead-based yellow, perhaps the massicot lead oxide (PbO) previously resulted by the Raman spectroscopy. Owing to the absence of traces of tin in the results, lead–tin yellow type I (Pb2SnO4) and lead–tin yellow type II (PbSnO3 or PbSn1-xSixO3) could be apparently excluded from the possible used pigments. Moreover, the absence of antimony in the spectra may exclude the use of the lead antimonite, also called Naples yellow (Pb2Sb2O7) . On the other hand, the presence of elements as arsenic and zinc could suggest either the use of different typologies of yellow pigments or the addition of such materials due to artistic techniques or practices. The arsenic, which may refer to the smalt composition only, is known for its arsenic sulphides pigments (invisible to the IR spectroscopy), as the orpiment and the pararealgar. Unfortunately, as the molybdenum of the X-ray tube anode (2.9 keV) hides the typical fluorescence emission values of the sulphur (2.3 keV), it is not possible to verify its presence in the sample. Moreover, zinc-based substances as zinc sulphate (white vitriol) or zinc oxide were frequently added to pigments as driers or preservatives [29, 30]. Another element found in the sample is calcium, surely related to the calcium-based filler either in form of gypsum (calcium sulphate) or in chalk (calcium carbonate). The presence of pure gold is due to the pictorial decoration of the paste surface, made with shell gold applied by brush: the difference between its recto/verso measurement values confirms its presence in the recto only. Iron and copper are also visible in the spectra, probably referring to the composition of an iron-gallic ink: they were produced by mixing tannins (vegetal extracts obtained by gall-nuts) with inorganic salts called vitriols, consisting of iron sulphates with other metal sulphates such as manganese, copper, zinc, lead and others . The sample 4_BNM_1869 was investigated to detect the nature of the red colour . Initially, the procedure aimed to discover the presence of iron(III) ion-derived pigments, like red ochre; however, results were negative due to the absence of the final blue precipitate, the Prussian blue. The research on sample 4_BNM_1869 followed as a second hypothesis the presence of lead(II) ion-derived pigments, like red lead (or minium). Consequently, the spot test sensibility to lead ion was positive, producing a final yellow lead iodide precipitate. The green substance on sample 6_1869_BNM was supposed to be a copper-based pigment . Spot test analysis followed the research methodology for copper(II) ion-derived substance, but the final colour of the precipitating solution was not red-brown as it should be. Nevertheless, the solution responded to the test with the formation a blue precipitate, the Prussian blue, thus indicating that the green colour contains an iron-derived pigment. By ATR-FTIR and XRF analyses, sample 5_1869_BNM (Fig. 6) was thought to be composed by a mixture of gypsum, chalk, animal glue and pigments, with the final effect of a relief greenish paste. The presence of sulphates was investigated by spot tests: after the procedure, the final presence of a white precipitate in the solution and its turbidity indicated the presence of sulphates, probably related to gypsum. Finally, it was detected by the Quantofix® Sulfate test strips. The presence of sulphates could also depends on the use of pigments such as arsenic sulphides pigments, zinc sulphate (white vitriol) and lithopone. In general, the majority of materials involved in the cover decoration of the Commissione Dogale have been identified or, at least, supposed or excluded. The leather was gilded with a gold leaf application and no thick layers of adhesive or other substances have been observed in the cross sections, for instance red bole. It was not possible to detect a possible protein adhesive, for example egg white or animal glue, because of the leather presence on the samples. For the same reason it was not possible to confirm the hypothesis of an oil gilding (oil-based size or ‘mordant’ to adhere the gold to the surface): the varnish covers the entire surface, obstructing this specific analysis. In terms of pictorial decoration, the black ink signs bordering the floral patterns present an iron-derived composition: an iron gall ink was probably used to trace them. 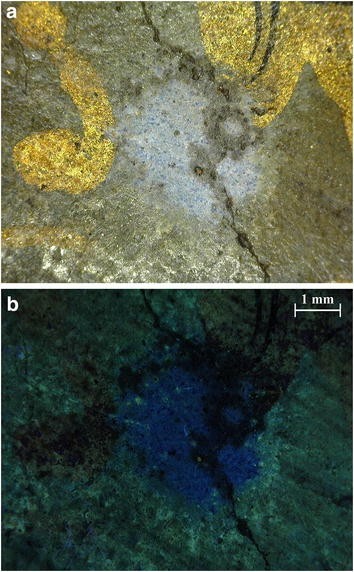 This composition was confirmed by the XRF analysis of the sample 5_1869_BNM sample, recto: iron and copper were found, suggesting that both the elements were involved in the iron gall ink composition. The red colour is a mixture of a lead-derived pigment, likely lead-red (minium) as indicated by the spot test, and a binder. It was not possible to determine the nature of binders for the presence of proteins and oils in the sample, derived from the leather and the varnish respectively. Likewise, the green colour is based on an iron-derived pigment, which might be identified as a green earth. The thick greenish paste consists of gypsum (calcium sulphate) and natural chalk (calcium carbonate) mixed with a protein adhesive. The greenish colour derives from a mixture of blue smalt (which contains potassium, cobalt, nickel, arsenic, bismuth, silicon and possibly iron)  detected by ATR-FTIR/XRF spectroscopies, and of a yellow pigment, probably the lead oxide massicot detected by Raman spectroscopy. It was not possible to exclude the use of other yellow pigments derived from the arsenic sulphide (i.e. pararealgar due to the light induced modification of realgar), since it might be compatible with the Raman/XRF results. The identification of the yellow Pb-based or As-containing pigments should not be considered as final: this is due to the multi-compound and multi-ratio nature of the sample which was analysed in the totality of layers and materials. Although the ATR-FTIR/Raman/XRF combination confirms the presence of some elements, this might be related to substances other than yellow pigments. In addition, the modalities of analysis and their methodologies present some limits due to their features: the molybdenum of the X-ray tube anode used in the XRF spectroscopy might have not detached the arsenic sulphides pigments fluorescence, which are invisible to the ATR-FTIR spectroscopy; in the same way, the ATR-FTIR spectroscopy do not show minor peaks because of the overlapping. The research should be further developed in order to transform the suggestions on the yellow pigments in a unique, positive identification. In the same way, the varnish composition could not be defined precisely due to peaks similarities in ATR-FTIR spectra, therefore other analyses should be carried out. The knowledge of the typology of substances involved in the cover decoration of the volume fulfils the main aim of the research: to plan an appropriate conservation treatment. Furthermore, the results offer an important contribution to the understanding on the Venetian art of illumination. Marcon  compared the sumptuousness and preciousness of the decoration style and technique of the 16th century Venetian sunk-panel covers to some of the most lavishly illuminated liturgical Venetian manuscripts, the Graduali of the ducal church of St. Mark in Venice. The comparison was based on the similar iconography and dating of the East-derived motifs especially located on the border frames of the illuminated initials of the Graduale de sanctis, a die sancti Andree usque ad diem sancti Clementis (Graduale Inv. 20, dated Venice, 1568) held by the Museo Marciano, Venice, and of the decorated sunk-panel covers. Marcon attributed the Graduale Inv. 20 miniatures to two Italian masters, one of them recognised in Giovan Battista da Udine . The link between liturgical illuminations and cover decoration suggests that miniaturists were likely involved in the final step of the sunk-panel Commissioni Dogali production: perhaps their decoration was assigned to famous masters’ hands or workshops; masters’ names could be directly related to those of such important liturgical texts. In 2016, the Cambridge Illuminations Research Project  and the MINIARE (Manuscript Illumination: Non-Invasive Analysis, Research and Expertise) project  further developed the study on the Venetian illuminations with a research focused on the scientific analysis of some cuttings hold by the Fitzwilliam Museum (FM) . The FM’s Marlay cutting It. 40  belonged to an Antiphoner produced between the 1560s and the 1570s as part of a set of Choir books for the ducal church of St. Mark. The cutting is an illuminated initial, the letter O, and was attributed to Giovan Battista da Udine by Marcon [33, 34]; in addition, the Graduale Inv. 20 illuminated initials iconography is quite similar to that of the Marlay cutting It. 40. The cutting was analysed by Ricciardi and Beers and its pigment characterisation resulted to be strikingly connected to that presented in this article: pigments like red lead, lead-based yellow with a high content of zinc (although that in the cutting was recognised as lead–tin yellow type II), pararealgar and smalt are included in the Marlay cutting palette, among others . In the present study, XRF measurements confirmed the presence of lead (the most intense peak in the spectrum), thus strengthening the Raman attribution of a yellow lead pigment (massicot), while excluded the presence of tin in the yellow pigment of the greenish paste. However, the presence of zinc was detected and attributed to driers or preservative substances, rather than to a pigment. This connection enhances the possibility that the same artists or workshops worked both in religious and political context, illuminating the Antifonario and the sunk-panel Commissione Dogale cover. The palette of the Commissione cover perfectly matched with the pigments and materials used in the 16th century by Venetian painters and artisans. Moreover, as the scientific examination results depict the Fitzwilliam’s cutting illumination as being realised by an Italian artist, the use of the same pigments for the Commissione cover could suggest that the nationality of the artist involved in its decoration might be Italian too, despite of the Eastern shape and overall configuration of the decoration. As Ricciardi states, the use of smalt is typical of the Venetian production, especially in the ceramic and glass-making industries. This could also suggest that the lavish objects produced in the 16th century Venice shared not only the Eastern decoration shapes, but also the same Venetian artisans and substances, involved in different art fields . Further investigating the book-binding decoration materials requires a new methodology: it should be based on techniques which might successfully bypass the limits presented in this paper. Issues concerning the heterogeneity and multi-ratio nature of the samples could be solved in two modalities. Firstly, permitting to move the volume to a scientific laboratory might allow analysing the entire surface in order to select the best areas in which further analyses should be performed. This could also avoid the previous mandatory step of sampling. Secondly, meaningful results on the pigment composition might be obtained by carrying out analysis with an approach that combines a higher spatial resolution with a more precise analytical resolution. This might involve techniques as the (micro)-XRD, SEM–EDS and (micro)-Raman spectroscopy. In addition, the exact compositions of the final varnish binders are not clear: other analyses should be carried out in order to reach this goal, for instance using gas chromatography (GC or HPLC) . The initial purpose of the study was directly related to the binding conservation treatment through the characterization of the materials present on the cover decoration of the BNM’s sunk-panel Commissione Dogale. Expectations were partially fulfilled as the main components of the decoration were individuated. Furthermore, the research represents the first scientific study on the material of a sunk-panel Commissione Dogale cover. 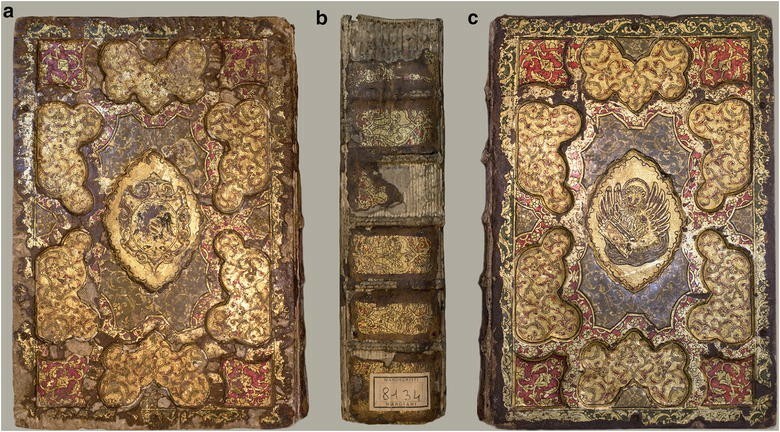 As the production of this kind of book-bindings could be considered as a serial one in the Venetian Renaissance, further scientific studies on other sunk-panel Commissioni will help to explain whether they were all produced by a unique workshop, perhaps using the same substances and modalities, or not. Consequently, the comparison of the results with other researches has led to an unexpected link of the decoration of the sunk-panel cover to the Venetian production of illuminated manuscripts. This likely indicates the nationalities of artists involved in this kind of production: the FM’s cutting study and the iconographical analysis of the St. Mark’s illuminated Antifonari define the illuminations as realised by Italian masters . The corresponding of most of the materials suggests that also the sunk-panel covers were produced by the same circle of artisans. In other words, the East-derived shape of the Antifonari illuminations and of the sunk-panel cover might be considered as an emulation of the Eastern taste, but carried out by Western artists. It enhances, once more, the connection between different typologies of 16th century Venetian objects sharing European structures, but Islamic decoration patterns. In conclusion, the research adds the sunk-panel Commissione Dogale to the group of Renaissance items belonging to the Eastern-influenced Venetian production that have been scientifically studied up to now: this group already includes a number of lacquered objects as cuoridoro , coffers and portals . The comparison of all these artworks could give a clear picture of their entire production. MR conceived the present study intended as a part of her Master’s Degree thesis. Scientific analyses were developed as follows: MR performed the sampling, the digital microscopy observation (both under white and UV light) and the stratigraphic studies; MDF performed ATR-FTIR spectroscopy and Raman spectroscopy, in collaboration with MR. Both the authors made the spot tests, under guidance and supervision of MDF, and carried out data interpretation. MR drafted and presented the poster with the research results at the FM International Conference; she also discussed the results implication and managed the research on the Venetian illumination field. MR wrote the entire manuscript and took pictures. The article was reviewed by MDF in the “Methods/experimental”, “Results” and “Discussion” sections, in the spectra and in the references. Both authors read and approved the final manuscript. MR is an independent book, paper and photography Italian conservator. She holds a Master’s Degree in Conservation from the Accademia di Belle Arti di Bologna (April 2017), with specialisation in conservation of library and archival materials; parchment and paper artefacts; photographic, cinematographic and digital materials (PFP5-DASLQ01). The Master’s Degree gives MR the official qualification of Conservator of Cultural Heritage by taking the Italian State final Examination (April 2017). This paper develops the research poster Illuminating book covers: 16th Century Venetian Commissioni Dogali, presented during the International Conference Manuscripts in the Making: Art and Science organised by the FM, Cambridge UK (8–10 December 2016). The presented scientific examination of the illuminated cover of a sunk-panel Commissione Dogale was part of the author’s Master thesis entitled: La legatura “a cassettoni” della Biblioteca Nazionale Marciana, Ms. It. VII, 1869 (= 8134): una Commissione Dogale tardo-cinquecentesca. Analisi Strutturale, Indagine Scientifica dei Materiali e Intervento di Restauro, ABABO, 2017. MDF is a post-doctoral research fellow at the Università di Bologna, studying the characterization of biomaterials by means of vibrational spectroscopies. Moreover, he has published several paper on the spectroscopic characterization of art materials, industrial and agricultural products. He holds a Ph.D. in Medical Biotechnology from the Università di Bologna (2008). He is adjunct Professor at the Accademia di Belle Arti di Bologna, teaching Diagnostic techniques. The authors are grateful to all the experts who improved this research with their professional skills and suggestions: (1) The XRF spectroscopy analysis was performed by Prof. Ferruccio Carlo Petrucci (TekneHub, Tecnopolo di Ferrara, Università di Ferrara) and by Dr. Anna Impallaria (TekneHub, Tecnopolo di Ferrara, Università di Ferrara). (2) Tests and sample preparations were enhanced by the suggestion of Prof. Lara Boselli (ABABO) and Prof. Elisa Isella (ABABO) respectively. (3) Data interpretation was further enriched by Dr. Silvia Pugliese (BNM), Dr. Claudia Benvestito (BNM) and Prof. Carlotta Letizia Zanasi (ABABO) as supervisors of the Master’s Degree thesis and of the Commissione conservation treatment. (4) The preliminary poster was improved by opinions, suggestions and reviews obtained from Dr. Pugliese and Dr. Benvestito. Special thanks to Dr. Pugliese who additionally reviewed this manuscript. (5) The authors would like to thank the ABABO board of directors and professors and they are grateful to the entire BNM manuscripts experts and to its team of conservators and librarians. The authors declare that they have no competing interests in the manuscript. A poster with the results of the preliminary analysis was presented by MR at the International Conference Manuscript in the Making: Art and Science organized by the FM, Cambridge UK, in December 2016. The scientific research was carried out under the auspices of the Accademia di Belle Arti di Bologna (ABABO) , in collaboration with the Dipartimento di Chimica ‘G. Ciamician’ of the Università di Bologna . The BNM kindly permitted to perform the set of analyses on its precious manuscript. MR received funding from the ABABO to attend the International Conference Manuscript in the Making: Art and Science, organized by the FM, Cambridge UK, December 2016, and to present a poster with the preliminary results in that occasion. The FM offered to pay the Conference fees for the author. Biblioteca Nazionale Marciana, Venice. https://marciana.venezia.sbn.it/. Accessed 25 Sept 2017. La Commissione Beni Culturali UNI-NorMaL. ISCR (Istituto Superiore per la Conservazione e il Restauro), Rome. http://www.icr.beniculturali.it/pagina.cfm?usz=5&uid=127&umn=71. Accessed 25 Sept 2017. Measley D, Walker C, Pemberton B. A summary of ultra-violet fluorescent materials relevant to Conservation. The Australian Institute for the conservation of cultural materials, Canberra, Australia. 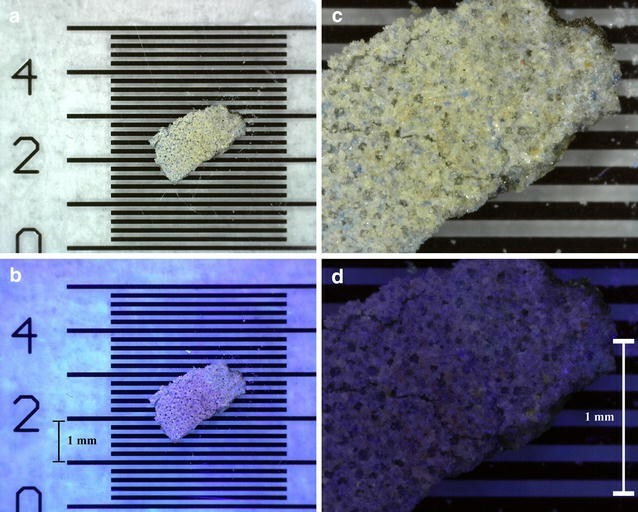 https://aiccm.org.au/national-news/summary-ultra-violet-fluorescent-materials-relevant-conservation. Accessed 10 Dec 2017. Cambridge illuminations research project, Cambridge. http://www.fitzmuseum.cam.ac.uk/research/cambridgeilluminations. Accessed 25 Sept 2017. The MINIARE project, Cambridge. http://www.miniare.org/index.php. Accessed 25 Sept 2017. The Fitzwilliam Museum, Cambridge. http://www.fitzmuseum.cam.ac.uk/. Accessed 25 Sept 2017. The Fitzwilliam Museum, Cambridge, Marlay cutting It. 40 image. http://webapps.fitzmuseum.cam.ac.uk/explorer/index.php?oid=176549. Accessed 25 Sept 2017. Accademia di Belle Arti di Bologna, Scuola di Restauro. http://www.ababo.it/ABA/restauro-materiali-cartacei-e-membranacei/. Accessed 25 Sept 2017. Università di Bologna, Dipartimento di Chimica ‘G. Ciamician’. http://www.chimica.unibo.it/it. Accessed 25 Sept 2017.